Because of circumstances Jeroen is not forming a new band at the moment. De bedoeling is het maken van experimentele psychedelisch getinte rock composities in de sfeer van Tool, Porcupine Tree, QOTSA, King Crimson. Gevraagd wordt creatieve verfrissende inbreng (meedenken over melodische en sferische invulling nummers). Zanger(es) moet eigen teksten en zanglijnen kunnen schrijven. Niveau: gevorderd of natuurtalenten. Motivatie, inspiratie en muzikale klik is belangrijk. Wekelijks oefenen in Amsterdam West, optreden waar dan ook. Denk je deze ingrediënten in huis te hebben neem dan contact op met Jeroen. Due to lack of success and differences in opinion on the musical course to follow Floortje and Arjan have decided to leave White Lily. George has indicated that he doesn't want to continue, but stays until a new drummer has been found, since Jeroen probably does want to go on. So White Lily will be on indefinite hiatus from now on. The cd-presentation of AfterVoiceS will take place on Thursday September 4 in the Volta. Furthermore we are selected for the Amsterdam Popprice 2008. We play the first round on September 17 in Cafe Pakhuis Wilhelmina. AfterVoiceS is out and available from now on. Artwork, lyrics and other info can be viewed here. A release party is to be announced. 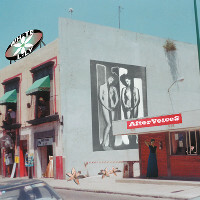 White Lily's newest demo ``AfterVoiceS`` is getting near completion. The music has been mixed, mastered and approved by the band and at this moment the final touches of the artwork are being worked on. New video's added on YouTube from the concert at De Blauwe Kip. Last week in De Blauwe Kip was a very cozy and good evening, we played nicely and are already looking forward to the next gigs the coming month. We have been filmed and pictures have been taken, soon there will be material from it online. Saturday we held a photoshoot in the Westerpark for the new demo and to have good band pictures. The weather was very nice and we assume that the pictures come out very well. Added: Pictures from the concert at Moisefestival. And the biography has been updated. From now on you can watch a video from the concert in The Cave on YouTube. 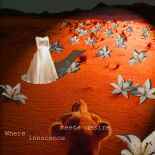 Back then White Lily was still instrumental. Next Saturday will be the first time you can see us with Floortje on vocals! Recently White Lily has completed their line-up. Floortje Jansen (ex-Belle Indifference) is our new singer and here you can find out more about her. Concerning the demo: the overdubs are done and the rough mixes are almost ready to be listened to by the band. We have listened to the recordings and chosen the right takes and considering the circumstances we are very satisfied about it. At this moment the recordings are being mixed by Jan Jaap and we expect a very good new demo soon. For the upcoming gig we also have something new. It will stay a surprise for a little while, but it definitely will be a special experience. So be there! The recordings will take place next week Friday March 2nd at the Conservatorium Alkmaar. Jan Jaap Doeven (ex-BluesMotel, the old band of our bassplayer Arjan) will record and mix them. The time has come for a new demo, and we will record it in January/February! More info will follow. In the meantime White Lily wishes you a very happy Christmas and a splendid New Year. And of course we hope to welcome y'all in The Cave on January 5th! The guestbook is back again! To stop the spam a check has been built in. Let's hope no more spam comes in. The new White Lily Website is online at last. Added: 2 pictures from our concert for the Winston Popprice. Guestbook is temporarily offline because of spam. Added pictures from the concert in Café Ed & An. Things have been quiet with White Lily lately, but that's about to change. In the meantime Erik has left the band due to personal reasons and as his replacement Arjan Kuijper (ex-Bluesmotel) joined. 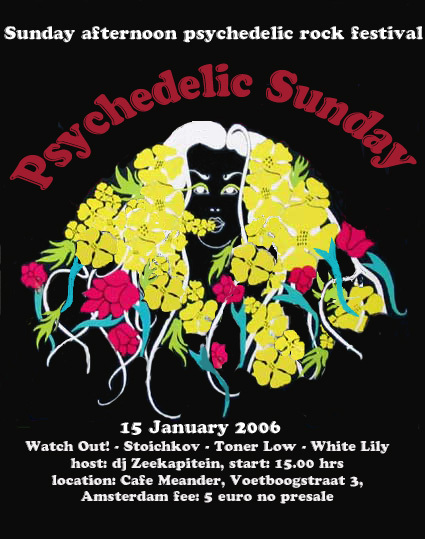 The current lineup is the strongest White Lily ever had and currently they are rehearsing to provide the venues in and around Amsterdam with the typical White Lily sound again. Added: 2 new songs for downloading. Look on the downloads-page. Pictures added of the performance in The End on the downloads-page. New domain name: www.whitelily.nl !!! Update your bookmarks! Added: pictures and movie from the gig last wednesday. Look on the downloads-page. Our next gig (26-5) is not in the Winston, but in Maloe Melo. This is because Winston had booked a double program the 26th; luckily they offered a replacement so we can still perform. We'll give a show at the Winston on 2-7. Marloes let us know that she won't be able to continue with White Lily because of personal circumstances. The band regrets this very much, but goes on without losing courage. After a long search White Lily finally found someone to do the vocals! The singer Marloes Scheffer, unknown until now, has joined the band lately. More information about her will follow soon. Guestbook added. Leave a message! White Lily website is on the air! Our new demo "Where Innocence Meets Desire" is finished now. Click on discography to see the tracklisting, on downloads to download a track, or on contact to order the demo.